He went to France in 1969 as the scholarship student of French government, and won the first prize of both the clarinet and the chamber music at the Conservatoire National de Région de Rouen. He completed the master’s course of this school next year. He studied the clarinet with Jacques Lancelot and Walter Boeykens, the chamber music with Reine Flachot in France. He won the first place at the French government cultural ministry soloist qualification contest. As the solo clarinettist of the Franz List Chamber Orchestra, he did concert tours to various places in Europe, Turkey, and Israel. Also, he gave chamber concerts with the Cleveland Quartet. In 1974, he joined L’Orchestre National du Capitole de Toulouze as the principal clarinettist. 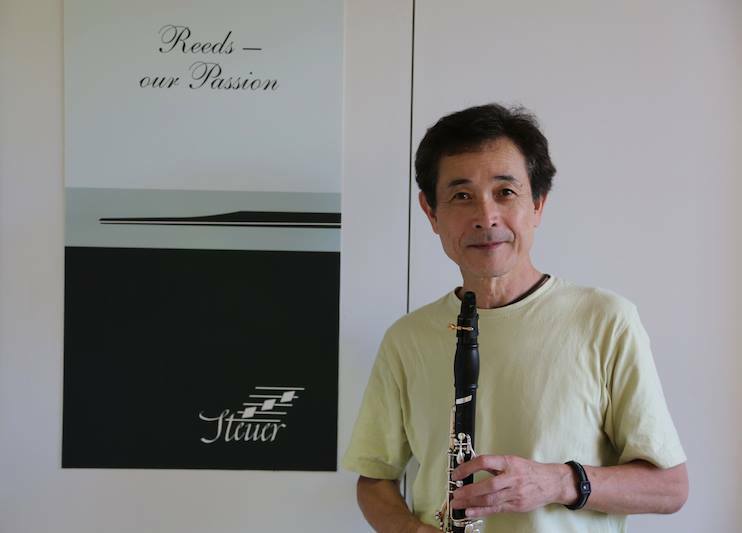 He is the first Japanese woodwind player who joined to a French orchestra. He did the concert tours to all around the world with the orchestra, and participated in the European main music festivals for 21 years until 1995. He did nearly 70 recordings with the main label such as EMI, CBS, and Deutsche Grammophon with the orchestra. Moreover, he played as a member of the Toulouse Woodwind Quintet. In 1992, the Toulouse Woodwind Quintet did a concert tour to Japan, and was favourably received. Recording was done in this occasion. He was a judge in the International Clarinet Contest in Brussels in 1990. Also, he was invited to the International Clarinet Congress that was held in Paris in 1996. After he gave the Japan debut recital in 1983, he came back to Japan every year and performed at the concerts, recordings, etc. He was invited as the assistant professor of the Kunitachi College of Music, and finally returned to Japan in 1995 after the 26 years life in France. His activities are now based in Japan. Not only on the performance activity but also he works aggressively on the educational activities, and is now bringing up a lot of musicians of exceptional talent. CD’s “Shigeru Ikushima Clarinet Scene Series I – IV” are released from the Fontec Records.